Are you wondering what your 1-year-old baby can eat? 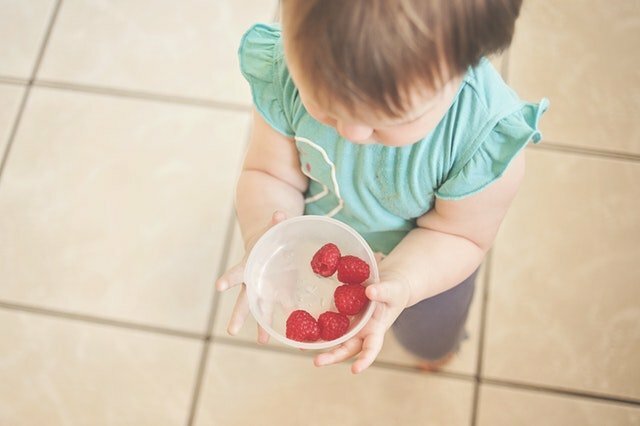 What you give him to eat now has a big influence on his future food preferences. Therefore it’s important to make sure that baby is getting only healthy meals. A toddler moves more and more, he crawls and walks, therefore he needs more energy. The more varied menu he has, the more likely it is that he will receive all important ingredients and nutrients, e.g. iron, proteins, vitamins and minerals. Usually 1-year-old babies start trying to eat many of the same meals as adults and they eat with their parents seating in a highchair. Shared lunches or dinners are a good way to strengthen family ties. However, the fact that your child is no longer an infant, does not mean that he or she is allowed to eat what mom or dad eats. What should be included in a menu for one-year-old child and what should be forbidden? Strongly flavored chicken soup, pork chops, pickles, fried cabbage… even if such meals are tasty for the child, they are not suitable for its little belly, because they can cause indigestion and constipation. These meals shouldn’t be included in the diet for a toddler. Remember that the things that baby eats have an impact on its future preferences. If toddler gets used to unhealthy and fat meals, in a few years he will not want to eat less flavored (but healthy) dishes. It could cause some serious health problems in adulthood. Instead of giving a toddler fried meat, it’s better to give him cooked, baked or braised meat. Potatoes or rice should be served without salt (or at least with minimum amount of salt). It’s also better to flavored salad with a small amount of olive oil, than to use vinaigrette sauce or ketchup. Also give up the sausages – they contain very little meat, but plenty of fillers, fat and salt. 1-year-old kid should not eat sweets. Sugar is hidden in many products and its excess causes caries and obesity. You shouldn’t give your baby cakes bought in the store, especially those with greasy creams or cookies with preservatives and colorants. What CAN one-year-old baby eat? Meals that we serve to our toddlers should be prepared from high-quality products. The menu for 1-year-old child should include lots of fruits and vegetables, eggs, meat and fishes. Toddler should eat five meals a day: breakfast, second breakfast, lunch, little snack and dinner. Between those meals you should not serve your child other snacks, so his stomach could rest from digestion. It is important to have your child eat at regular times. The rate of child’s metabolism is in the process of setting right now. 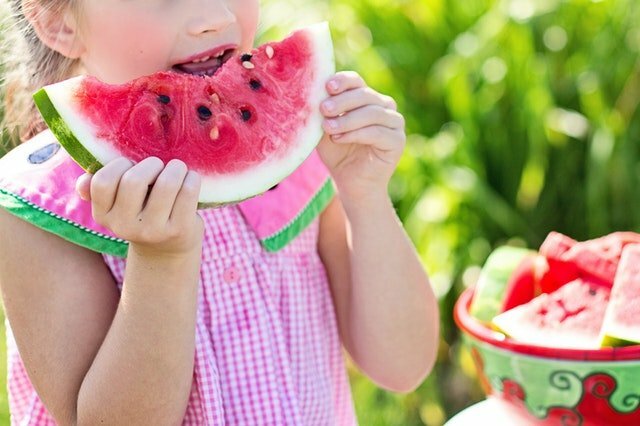 If the child eats irregularly, its body will start to accumulate fat and the metabolism will slow down. Water is the best and healthiest way to quench the thirst. Toddler can also drink fruit juices – of course freshly squeezed, not the ones that have added sugar. Beverages with added sugar, color, flavor or gas should not be included in toddler’s menu. The later the baby will taste salty, the more likely he will not get used to it. To prepare the food for the little ones do not use food concentrates (like bouillon cubes), because they contain plenty of salt and unhealthy extras. Instead, you can add to meals some herbs like basil or dill. 1-year-old baby don’t have to eat mashed food any longer. He can already bite and he should have plenty opportunity to do so. It’s important for his tooth development. Toddlers are usually very curious and full of enthusiasm for eating new things. We should seize that moment and learn our baby healthy habits e.g. to eat fresh carrot and drink water. They have plenty of vitamins and minerals (raw vegetable have the biggest amount). Toddler can eat as much vegetables as he want. The only exception is spinach, although it contains a lot of iron, it has also plenty of oxalates which impedes the absorption of calcium. Therefore toddler can eat spinach up to once a week. The best way to serve a toddler vegetables is to put them on a sandwich or make a salad with them. They also have a lot of vitamins, especially vitamin C, which strengthens the immune system. They also provide potassium, magnesium and other minerals. We can serve fruits as second breakfast or dessert. They contain a lot of carbs and thanks to which they provide energy. They contain also B vitamins and fiber positively affecting the digestive system. Instead of plain pasta or white bread you can serve your toddler porridge, wholegrain bread, coarse grits and pasta made of wholegrain flour. They provide a lot of proteins and iron, necessary for proper development. You can serve you toddler a turkey, lamb or chicken. Twice a week –year-old child should eat a fish, e.g. salmon or tuna, baked or steamed. The Pediatrician’s Guide to Feeding Babies and Toddlers: Practical Answers To Your Questions on Nutrition, Starting Solids, Allergies, Picky Eating, and More by Anthony Porto M.D. and Dina DiMaggio M.D.